It looks like the lovely folks at Random House will be sending me out on tour again, not just once but twice! I was certainly hoping there would be a Shadow Scale tour, come springtime – and there will be – but it looks like I may also have an opportunity to tour in early February to promote the North American paperback release of Seraphina. I will be posting dates and cities once I know them for sure. There are some exciting place-names floating around, but I don’t want to break anyone’s heart by telling you before it’s carved in stone. 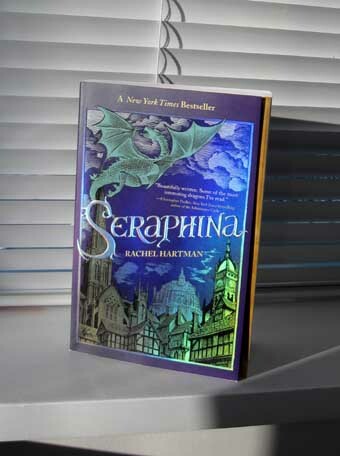 Seraphina comes out in paperback on December 23rd. You can pre-order it already, of course. You may be thinking that we’re cutting it a bit close for Christmas, but I believe the hope is that when people go shopping after Christmas — returning things they don’t want, or spending gift cards — that there she’ll be, all shiny and new. The paperback has some new material: an author Q&A, authors who influenced me, a list of music I listened to while writing, a study guide. 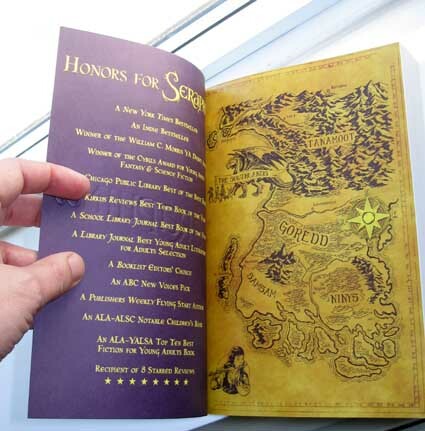 I understand there are some copies coming my way, so I’ll tell you more when I’ve got the book in hand. I suppose that’s all the news for now, unless you want to hear about how my apartment flooded. I’m not sure I’m ready to tell that story yet, but I will just say: if you hear the sound of rain coming from inside your closet, it’s best to find the source of the noise right away. It’s really not supposed to be raining in there. A thing! I just reached 30K words, which suggests it may be bookish, this thing. However, I asked my lovely in-house editor whether I may announce this in some way, and she said yes, so here goes: I get to write two more books set in Seraphina’s world! The working title for the first one is TESS IN BOOTS. Obviously that might change. I anticipate another duology, but that could also change, if it turns out Tess can be all contained in one book. I sort of doubt it, the way things are going right now, but then again, this stage of crafting is less like writing and more like coughing up hairballs. How’s that for a glamorous image? Ah, the writing life! I hurk all day and gag all night. Seriously, though, I’m having fun, which may be the very most shocking thing of all. I was burned out for so long I’d forgotten what that’s like, and I was also a little bit worried that once there was an actual deal, actual numbers and expectations, that the weight of that would descend on me again. So far, however, it has not. Weirder still: I don’t think it’s going to. This book is different. I feel like this book is already written, like some part of me has been working on it for years and all I’m doing now is discovering the pieces. It will still take some effort and ingenuity to fit them together; I’m certain there are unforeseen frustrations yet to come, brand new headaches I’ve never had before. Doesn’t matter. Bring it, I say. Remind me I said that when I’m grousing later on, would you? Here we are again, at the month I love to hate, when the days grow dark and the intractable rain sets in and there isn’t even Thanksgiving (here in Canada-land) to break up the gloom. Last year I proclaimed it the True and Holy Month of Nothing, which went really well. I hope to loaf a little less aggressively this year, however, because I have something I want to work on and I’m not nearly as burned out. And hey, the month is off to an auspicious start! Suspiciously auspicious, if you ask me. I am ever sceptical of November’s motives. I had an excellent writing morning, however, and then it was so sunny (contrary to November’s usual practice) that we all went for a bike ride. We found a delicious tapas place for dinner. Can’t ask for better than that. Does November get you down? Well, pull up a rock beside the fire. I’m planning on toasting marshmallows and singing stupid songs all month long.